Flowery, grandiose language is pretty much par for the course when it comes to describing a fresh concept’s aesthetic, and the LIV-2 is no different. SsangYong starts off with its newest design language, dubbed “Dignified Motion,” which is slated for other future models. The LIV-2 also takes inspiration from nature with the philosophy “Nature-born 3Motion,” plus the traditional SUV personality traits of masculinity and hardiness (“Robust Aesthetics”). As for the sizing, the LIV-2 looks to preview the automaker’s upcoming SUV efforts in the mid-size D-segment and full-size E-segment. Although this model is sharper and more technical than its predecessor, the lineage between the LIV-1 and LIV-2 is obvious. The body itself is draped in white, with both matte and gloss finishes on the panels. Although this model is sharper and more technical than its predecessor, the lineage between the LIV-1 and LIV-2 is obvious. Let’s start in front, where we find a grille and headlight combo that blends together in an attempt to mimic the wings of a bird. The fascia is similar to what was used for the Tivoli, and will be used across the automaker’s future lineup. The corner lights in the lower bumper come in triplets, while silver skid plates ward away threats to vulnerable mechanicals. In profile, it looks like most of the preceding concept’s lines were retained, including the bulging character lines that accentuate the rear fenders. This look was also used with the Tivoli, and will be implemented in all future SsangYong models. To my eye, the crease really pulls the clean design together, while also adding a nice bit of beefiness. The roofline falls straight towards the hatch in back, while large five-spoke wheels come wrapped in meaty tires. The windows get polished surrounds, and step assists are hidden under the body. The tail was updated from the LIV-1, bearing a cut that looks square compared to the preceding concept’s more rounded look. The taillights get new backup lights in the center, complemented by further backup lights in the corners of the bumper. Below, we find a skid plate with two cutouts for the exhaust. Up top is a roof spoiler. The real question is how much influence the concept will have over the upcoming Rexton-replacement. At the moment, the production SUV is rather plain, at least compared to something like the LIV-2. While beefy in its proportions and stance, the current production model has none of the sharpness or boldness of this design study, and although the wheels and various extraneous lights that dot the concept will most likely hit the dustbin before the next-gen Rexton rolls off the assembly line, I’d love to see some of the concept’s fender creases and fascia lines make the cut. 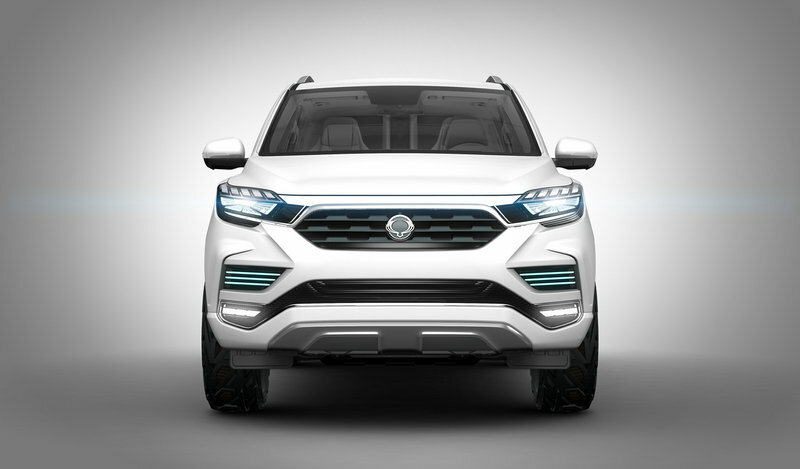 Finally, it’s expected that the final production iteration of the LIV-2 will be both longer and wider than the current Rexton. Like the exterior, the interior of the LIV-2 is draped in white. Offsetting this is a good deal of piano black trim, as well as adjustable ambient lighting that enhances the door panels and the console. Complementing the interior lighting is exterior illumination along the electric side-ups, which should help aid ingress and egress, even at night. The LIV-2 looks to underscore the rear seating area, where we find two individual captain seats in place for relaxation and entertainment, or working and productivity. As far as layout is concerned, the LIV-2 looks to underscore the rear seating area, where we find two individual captain seats in place for relaxation and entertainment, or working and productivity. 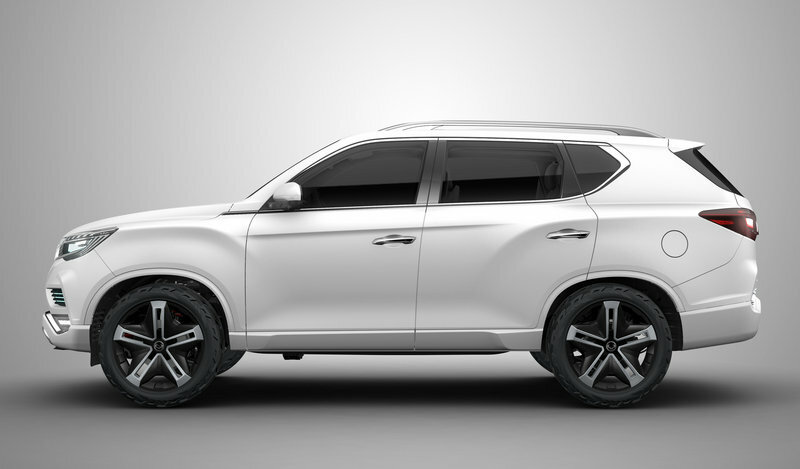 As such, passengers will enjoy plenty of space – SsangYong says it hoped to instill the LIV-2 with an almost limo-like ambiance, even mentioning a chauffer in the press release. A control-studded rear console (plus touch panel) enhances this passenger-centric focus, while each of the four seats comes with a recline and massage function. Leather upholstery with a Geonic pattern adds the right texture. But modern luxury should also include new technology, and the LIV-2 follows through with a slew of screens and infotainment features. There are three displays spread across the cabin, including a 9.2-inch unit in the center console, and two 10.1-inch units in the headrests facing towards the rear. There’s also a Wi-Fi hotspot, plus the usual smartphone support (Apple CarPlay, Android Auto, headset interface, phone recharging capabilities, etc.). On the safety front, the LIV-2 gets nine airbags (front, front and rear side, curtain and driver’s knee), plus a suite of the latest passive and active features thanks to the inclusion of radar, lasers, and a camera. That includes automated braking and obstacle detection, which will warn the driver when a car or pedestrian is in the car’s path and automatically apply brakes if needed. There’s also traffic safety assist and high beam assistance for night driving, lane departure warning, blind spot detection, lane change assist, and a rear cross traffic alert. As for predictions for the production model – I’m guessing SsangYong will end up ditching the four-person layout in favor of a more traditional five-seater. And like the current Rexton, seven passengers should also be on the table. That means the rear control console will probably get the axe. However, the three-spoke steering wheel, digital gauge cluster, optional high-end materials, and displays up front should remain in one form or another. The same goes for the Wi-Fi, Apple CarPlay and Android Auto. The airbags should come standard, while the advanced features like automatic braking will probably be offered for extra outlay. Providing motivation is a 2.2-liter oil burner. Helping the diesel powerplant achieve a nice mix between power and efficiency is a fifth-gen Electronic-Variable Geometry Turbocharger, and 2,000 bar direct injection. Other features include a variable oil pump and low-tension piston rings, both of which help to lower overall engine friction. Scrubbing the stuff coming out the tailpipe is a Low-Pressure-Exhaust Gas Recirculation system, which uses an exhaust gas recirculation valve, Nickel-plated compressor wheel, and “I-flow & wavy fin type” exhaust gas recirculation cooler to keep it all compliant. Helping the diesel powerplant achieve a nice mix between power and efficiency is a fifth-gen Electronic-Variable Geometry Turbocharger, and 2,000 bar direct injection. As for output, torque peaks at 420 Nm (310 pound-feet) between 1,500 and 2,500 rpm. SsangYong declined to mention horsepower figures. Interestingly, 310 pound-feet is an increase compared to the automaker’s current 2.2-liter unit, which was just updated for 2016 to produce 176 horsepower and 295 pound-feet of torque. Perhaps another update for 2017 is in the works. If gasoline is more your thing, the upcoming production model should also offer a 2.0-liter turbo alternative, which apparently uses an integrated exhaust manifold head and an electric waste gate actuator. 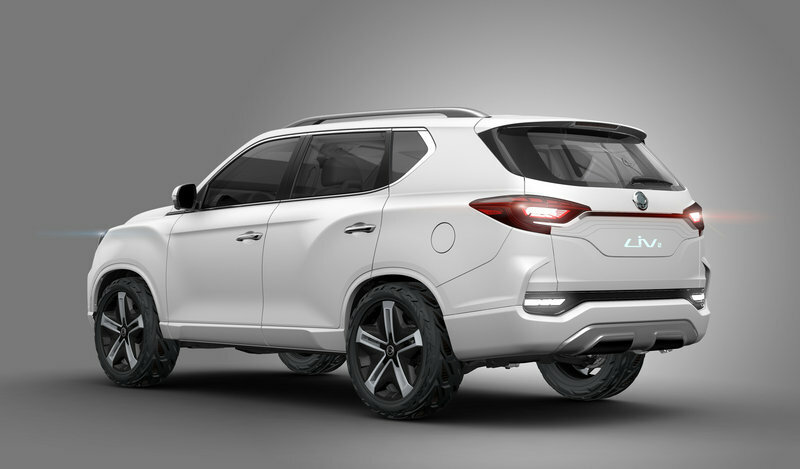 No output figures on this were released with the LIV-2 Concept, but considering the current Rexton employs a 3.2-liter with 217 horsepower and 230 pound-feet of torque, we’d expect roughly equivalent peak figures for the downsized option, plus higher mpg and lower emissions. Handling the cog swaps will be an automatic seven-speed sourced from Mercedes, but an eight-speed transmission is expected soon after the production model’s big reveal. What’s more, FWD is expected as standard, with SsangYong’s in-house developed 4WD offered as an option. Underneath it all is body-on-frame construction, which is pretty ancient as far as underpinnings go these days, but the design does help when it comes to toughness and towing capacity. The tires on the concept were created specifically for going into the rough stuff, but as anyone who has driven an off-roader knows, those thick treads can make a racket when cruising on pavement. As such, the LIV-2’s tires have a unique tread pattern to keep them quiet. As for production, we’re thinking more humdrum all-season rubber. SsangYong asserts this thing has the potential to go almost anywhere in total ease and luxury. That’s a rather audacious claim, but hey, it’s exactly the sort of language you gotta use when dreaming up your next-gen flagship, especially when you boast about your position as Korea’s leading manufacturer of 4x4s and SUVs. All told, the production next-gen Rexton is expected to make its debut sometime in 2017. 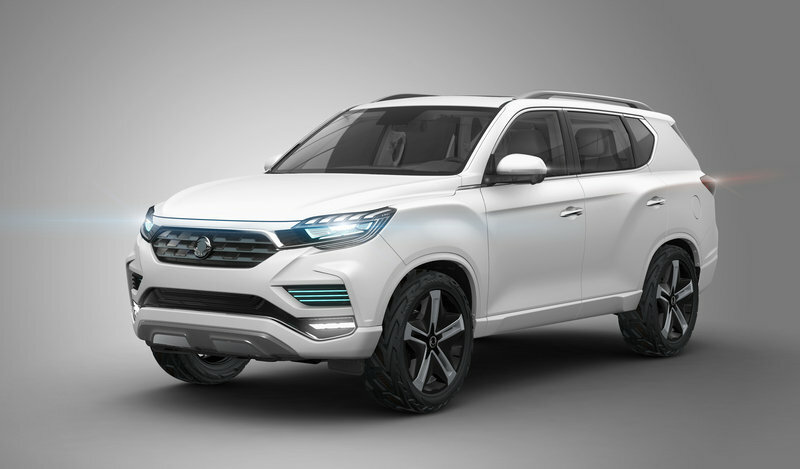 Suffice to say, the production variant will be crucial to SsangYong’s development, but based on this concept, the SUV appears to be headed in the right direction. The styling is interesting, there are several powertrain options on the table, and there’s lots of tech waiting in the wings for those who need it. But again, we still don’t know for sure what we’ll see when this thing hits production. The styling will most likely see a massive detune, as will the interior. Pricing is also up in the air, as this move towards a more premium approach might place it amongst some heavy-hitting competitors. How many features will make it to production? How will it price out? Continuing the development philosophy of ‘Robust, Specialty, Premium,’ which has underpinned other concept cars recently from SsangYong, this new and authentic SUV concept pursues the emotional interface between the driver, passengers and car, and will evolve to become another key strategic model within the SsangYong product range and drive future growth. The car is expected to be introduced during 2017. Featuring a strong and durable body-on-frame construction and utilising SsangYong’s specialist four-wheel-drive system, the LIV-2 is equipped with an intelligent interface that facilitates active communication between the driver and car. The ‘limitless potential’ of the LIV-2 implies it can go almost anywhere, while also offering premium comfort and the driving experience of a luxurious limousine, with abundant space in the second row of seats and equipped to achieve the most relaxing ambiance. As the next generation flagship model for SsangYong, LIV-2 is an executive SUV which has been strategically developed to take the brand into new areas of the market. 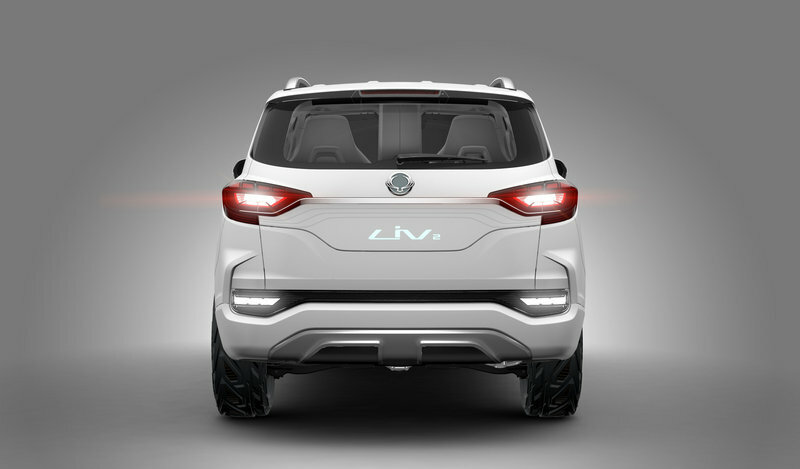 In the same way that concept cars for the SsangYong XIV (eXciting user-Interface Vehicle) and SIV (Smart Interface Vehicle) presented the company’s ideas for both sub-compact and compact SUVs, the LIV-2 indicates the direction being taken for mid-size D-segment and full size E-segment SUVs. Strong, resourceful, charismatic and dignified while at the same time graceful, the car takes its inspiration from the ‘Dignified Motion’ of SsangYong’s design language, ‘Nature-born 3 Motion’. The look of this strong, authentic SUV is informed by restrained sensitivity, and a contemporary expression is realised through the matt white body finish and white-hued interior, emphasising a futuristic yet powerful aura inside and out. This fresh, modern and appealing style has been created through the fusion of its robust, dignified body, dramatic-look air intakes, and a cohesive appearance at the front that blends the grille and headlights seamlessly. The radiator grille resembles the spread wings of a bird - first seen on Tivoli and symbolising liberty and freedom, and this new front end design will now be shared across all future SsangYong models to create a distinctive and recognisable new identity for the marque. Additionally, the intense character lines on the car’s side - especially towards the back where they rise up towards the rear bumper, and again first seen on the Tivoli, will also become another future styling cue for SsangYong. Notable new features include electric side steps fitted to both sides for safety and convenience, and advanced technology that creates an illuminated path for passengers approaching or leaving the car at night. The tyres for the LIV-2 concept have been developed to be suitable for driving off road. A differentiated angle and layered tread pattern helps to diffuse noise even on uneven surfaces, while the risk of aquaplaning in the wet is reduced by using a high stiff block and deep groove tread. The concept’s body colour is an expression of luminescent light that conveys purity and mystique. A combination of matt and gloss white has been used to communicate the dignity of the car’s shape. The design brief for LIV-2 was to create a contemporary executive lounge within a luxury, chauffeur driven limousine, and as well as having copious space to work or relax, it should be equipped with a suite of advanced communication technologies. The chauffeur driven concept places the emphasis on the rear seat passengers who are afforded individual seats and a fully connected centre console. Each seat reclines, and includes massaging vibration at the touch of a button. Fine leather, Geonic pattern and piano-black gloss accent panels present a harmoniously presented modern environment, while fully adjustable mood lighting subtly positioned to highlight the console and door panels create a futuristic, sophisticated ambience. An integrated communication system with three displays - a 9.2-inch monitor in the centre fascia and a 10.1-inch monitor in each headrest, wi-fi mirroring for devices, Apple CarPlay and Google Android Auto enhance connectivity for passenger pleasure while travelling. This can all be controlled from the second row centre console, which gives access to the infotainment system via a touch control panel for ‘surround sound’ and premium entertainment quality, as well as unrestricted smart phone use with headsets and phone recharging. LIV-2 is powered by SsangYong’s own 2.2 litre Euro 6 diesel engine with a 2,000bar common rail direct injection system to achieve a powerful yet efficient performance, while reducing noise and increasing responsiveness. The low-speed fifth generation E-VGT (Electronic-Variable Geometry Turbocharger) helps deliver a maximum torque of 420Nm within the range of 1,500 - 2,500rpm. Increased fuel efficiency is delivered through reduced engine friction achieved by using a variable oil pump (VOP) and low tension piston ring pack. And by employing LP-EGR (Low Pressure-Exhaust Gas Recirculation) - combining an EGR valve, Nickel plated compressor wheel and an I-flow & wavy fin type EGR cooler, NOx emissions are reduced under higher rpm and torque load. This powerful engine is matched to a Mercedes-Benz 7-speed automatic transmission, and delivers a fun-driving experience with optimal performance and efficiency. 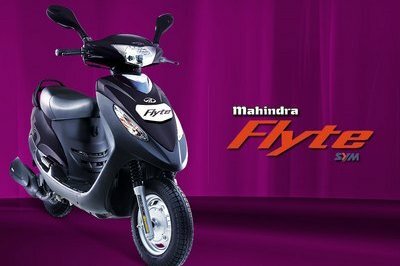 A newly developed petrol 2.0 litre GDi turbo engine is also available. Featuring an integrated exhaust manifold head with an electric waste gate actuator helps achieve good fuel efficiency as well as excellent NVH (noise vibration and harshness) values. LIV-2 underpins SsangYong’s commitment to safety, not only for the driver and passengers, but also for pedestrians. Passenger safety has been a high priority, and the LIV-2 features no less than nine airbags: front, front and rear side, curtain and driver’s knee airbag. The car is equipped with an advanced emergency braking system (AEBS) which warns the driver when an obstacle such as a car or pedestrian is detected by radar and laser scanning, as well as a camera sensor positioned at the top of the windscreen. In certain situations, the AEBS can also activate autonomous emergency braking for optimum protection. LIV-2 can also actively avoid collisions at blind spots or intersections by using traffic safety assist (TSA) and high beam assistance (HBA) which helps the driver achieve optimum nighttime vision. A lane departure warning system helps minimise the risk of an accident on a motorway, while blind spot detection and lane change assist use two radars to help prevent colliding with hidden objects. A rear cross traffic alert system also protects both rear corners of the car when reversing out of a parking bay, significantly reducing the danger of having a rear three quarter collision.